Over 750,000 people of working age in the UK have cancer. Cancer survival is improving and has doubled in the past 40 years in the UK, as the age of retirement rises, meaning more people with cancer are still working. Around 180,000 men a year are diagnosed with cancer, and by 2027 Cancer Research UK believes around half of men will get cancer during their lifetime. A new guide seeks to support men who wish to continue working after a cancer diagnosis. The publication Working with Cancer, set out in the format of a Haynes workshop manual – best known for car repair books – explains that continuing work can help recovery by providing something other than cancer to focus on and keeping things ‘normal’. Work colleagues and trade unions can be a great source of support, according to the guide, written by the European Men’s Health Forum and funded by the Burdett Trust for Nursing. Finding a working solution that is right for the patient, their family and their employers can take some thought, it says. It provides practical advice on legal rights, sickness benefits, and issues to consider when developing a Return to Work plan. Men may also be entitled to help from the government’s Access To Work scheme for aids and adaptations, travel, taxis and even a support worker. ‘More men are retiring later, which coupled with early diagnosis means that we are speaking to more men of working age who have been diagnosed with prostate cancer. I really encourage men to contact their workplace through their occupational health services as soon as possible, and keep that communication going, so that when they are ready to return employers understand and can help with the kind of reasonable adjustments that need to be made. 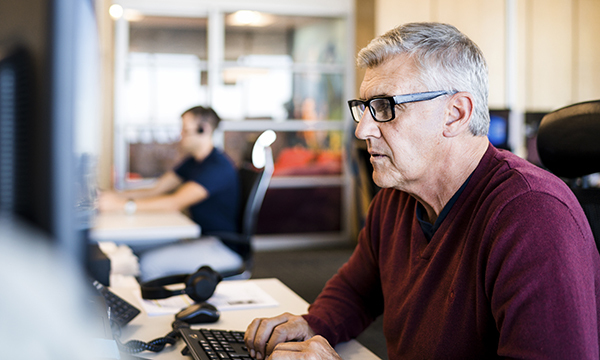 Encourage people with cancer to contact their manager, occupational health team and HR department early on to discuss options and requirements for support. Encourage them to be clear with bosses about the disease and its treatment, and the impact it will have. Working can give people a sense of normality and routine, and may be essential for financial reasons. It can also provide support through colleagues, friendships and social events. Legally, employers have to consider making reasonable adjustments to help accommodate people’s needs following a cancer diagnosis. Examples include flexible working hours, time off for appointments, special equipment, revised duties and home working. Having cancer can lead to many emotions that may impact on work, including anger, guilt that you have been working and loss of confidence.